Romanian actress, writer and artist, who emigrated to France when she was 10 years old. published nearly 30 children’s books (translated into more than 15 languages). Badescu uses different artistic means to create a narrative approach between text and graphics. 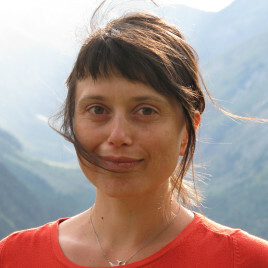 Together with the illustrator Benjamin Chaud, with whom she collaborated on more than 15 children’s books over the past 13 years, she created the extremely popular series of children’s books about the adventures of Pomelo – an elephant that is small (it can hide under a puff-ball) but very smart. Badescu also writes for theatre and is currently co-producing a documentary film. Also, author and illustrator of the children’s book Tiens.